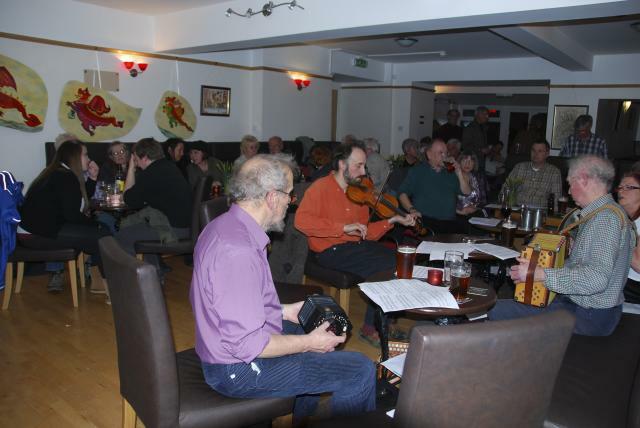 Tuesday nights: Glossop Folk Club. A singaround, with a wide variety of folk-type songs, traditional or modern. Also instrumentals or other things – poems, monologues, whatever you want to contribute. A good opportunity to try out your songs (or whatever) in a friendly and informal group. Or just come and listen – no pressure to perform if you don’t want to. Starts about 9 pm. No charge. Contact Robin (01457 861606 robclay41@talktalk.net) for information. Wednesday nights: Singing Group. Usually. the second Wednesday each month. Very informal sessions - we just sit round and sing some of our favourite songs. All sorts of songs - music hall, folk, modern, whatever. If you enjoy singing, even if you think you can't sing, come along. Absolutely no pressure! Bring some of your own favourites for the group to try out, if you want. Click here to see some of the songsheets we have been using. This gives you an idea of the wide range of material. Starts at 8 pm, finishing at 10 - but you can drop in (or out) at any time. No charge. Contact Jeremy (01457 866753 jeremywdale@yahoo.co.uk) to check the date of the next session or for any other information. Friday nights: Music session. Mostly instrumental (but singers are not barred). Come and join in, whatever your instrument. Mainly folk-type stuff (all acoustic), but anything goes – but be prepared for others to try joining in on your contribution. Starts about 9 pm. No charge for admission. Contact Joe (jobrin116@btinternet.com (01457 867968) for information. 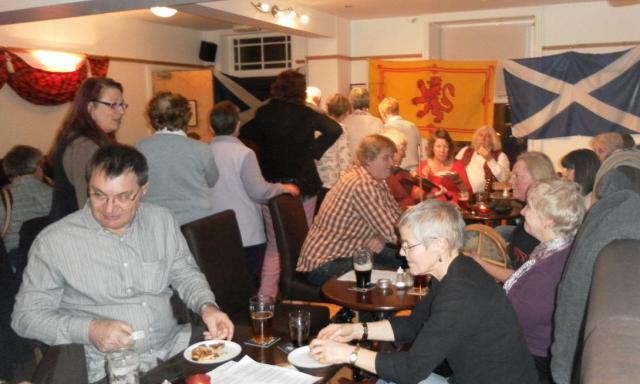 A selection of 100 tunes (in 3 volumes) that are frequently played at the music sessions at Glossop Labour Club can be downloaded from the Music page. For the benefit of anyone who may be new to these, or indeed any, sessions, if you know any of these tunes we’ll be happy to join in. Of course you can suggest other tunes – we play lots of others as well, and we’re happy to try to join in new ones. One big advantage of suggesting a tune is that if you start it, we’ll play it at your speed! Very informal and friendly, so an ideal occasion if you are a beginner or are not used to performing together with others. 4th Sundays. Music session. Similar to the Friday night sessions, (but generally more varied - songs, poetry, whatever). Starts about 8.15-8.30 pm. Contact Joe (jobrin116@btinternet.com, (01457) 867968) for information. Joe usually sends out an e-mail reminder about these sessions; if you want to be added to the list, let him know. Note that it is the 4th Sunday, not the last Sunday! The same thing in most months, but not always. See the Special Events page for the date of the next session. In some months, we have an extra themed session on a Saturday. These usually have appropriate food, and other relevant activities, and are very popular. No charge for admission, but we ask for a contribution to the cost of the food. These themed nights usually start at 8.00 rather than 8.30. See the Special Events page for information about these themed sessions, when they happen. We are visited each month by the Glossop Folk Train. This leaves Manchester Piccadilly at 18.59, with a group of musicians playing on the train. When they get to Glossop, they come to the Club for liquid refreshment and more music before returning to Manchester on the 21.48 train. See the Special Events page for information on the next Folk Train. For further information on the Glossop Folk Trains, visit the Friends of Glossop Station site. Red Ramblers. An informal walking group, usually 8-9 miles. Meet at the Club at 9.30 for car share or take public transport to the start. All welcome. Contact Jan at janglossop@gmail.com for more information about the walks. We are a group of friends walking together and are each responsible for our own personal safety. Five-mile walks. Looking for walks that are not too long, but with a bit of challenge? Record club. 2nd Thursday in each month, at 7.45. No record club in August. Come and listen to different genres of music on vinyl, and discuss them. You'll find a lot more about the record club on their website . Stitch Sisters - knitting, sewing and crafts. 3rd Thursday in each month, at 8.30. Contact Anne (01457 861398) for information, or just turn up with your knitting or sewing. Women's Group. Open to all women. Phone Anne on 01457 861398 for more details. Red Film Club. Monthly film showings, usually on the first Sunday, starting at 7.30 (bar open from 7 pm). Mostly films of social/political interest. See the Special Events page for details of the next film and future programme. People's Kitchen is a delicious, locally sourced evening meal, cooked and served by volunteers. Meals are vegan to make them as sustainable and accessible to as many people as possible. All welcome including kids, please note booking is recommended. For details of dates and other information, visit their Facebook page.